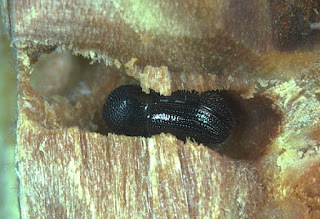 European shot borer Xyleborus dispar in plum tree, from here. Xyleborus is a cosmopolitan genus of xylomycetophagous (i.e. 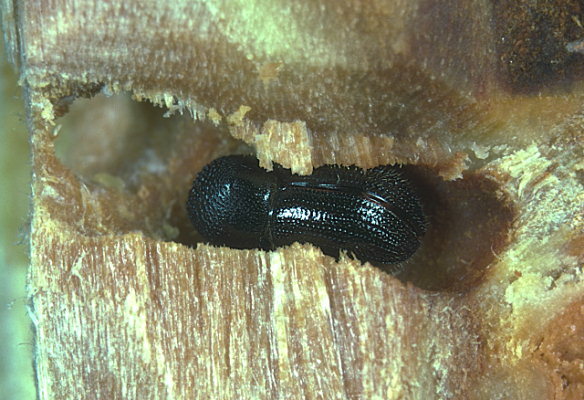 feeding on fungi growing on wood) bark beetles. Members of this genus are consanguineously polygynous, with haploid flightless males (Wood 1986). Characters (from Wood 1986): Females with body length 1.7 to 5.9 mm, mostly more than 2.0 times as long as wide; segment I of antennal club corneous, its distal margin very acutely elevated into a continuous costa (forming a complete circle) extending from anterior face to apex; basal segment of labial palpus enlarged, conspicuously wider than segment 2 or 3; lateral margins of pronotum rounded; scutellum visible, moderately large, its surface flush with adjacent surface of elytra; procoxae contiguous, intercoxal piece longitudinally emarginate (a few individuals in javanus group subcontiguous but only feebly emarginate), its posterior element inflated, occasionally dentate; protibia with posterior face almost flat, smooth.